Over the previous couple of years, the world of the Blogosphere has progressed quite handsomely. Nowadays Bloggers and webmasters are concentrating more on their website’s designing rather than focusing on their content. Undoubtedly, having a beautiful website is the latest trend and even visitors admire those blogs which are highly professional in terms of their Layout, Header, Footer, Menu and etc. Therefore, having a clean and perfect navigation are the basic needs of each and every blog. However, majority of blogs are still using the old navigation menus which kills the complete presentation of a blog. If your site’s navigation is not perfect then how can you expect your visitors to search your website in depth? 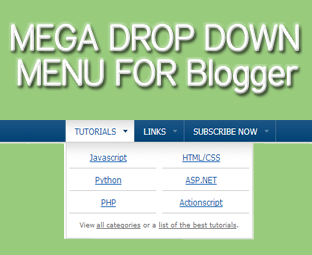 Today we will learn how to create a Fresh Mega Drop down Menu for blogger blogs. The biggest advantage of having a Mega navigation menu is that it keeps the thinks together in one place, so your visitors won’t have to spend much time in searching for a specific category of their interest. On the other hand, it will keep your blog look clean and elegant because the complete site navigation keeps things together. Unlike other mega menus, it has an elegant design which will compliment your website or weblog because you can easily change its color according to your desired needs. It is thin in size so it’s quite clear that it can easily fit any site without any problem whatsoever. Following is the animated representation of the MBL Mega Drop Down Menu. Following are some of the foremost features of the Drop menu which will not only amuse you but your visitors would love to play with it. It supports almost every browser i.e. Firefox, Chrome and Internet explorer. You can easily change its color to match the color scheme of your website. It has a cute Email Subscription box in the drop down menu that will maximize your subscribers. Just like our previous tutorials, the steps are pretty much straightforward and world hardly take 10 minutes to complete the integration. Just follow the following instructions correctly. Try to make a habit of creating a Backup of templates before editing it. Select Edit HTML >> Proceed. Now within the template search for ]]></b:skin> and paste the following Style sheet coding. Again search for </head> and above it paste the following JQuery coding. Now Save your template by pressing Save template button. Now with in your template search for the following chunk of coding. Remember it is not necessary that you have the exact same coding, just look for the similar coding. TIP: To Find the coding quickly Search for "Header1" or "(Header)". Once you have found the Similar coding then below it paste the following Mega Menu HTML Coding. Replace MYBLOGGERLAB with your RSS Feed Email Subscription Username. Replace All Light Pink,Light Orange,Light Blue Links According to your needs. We hope you have enjoyed the feast, this week we have shared almost three totally unique widgets i.e. Twitter Man, Sticky Footer and this Mega Menu. Our Developers are busy in creating a new Blogger Template so keep your figures cross. If you have any difficulty while adding this Mega Menu feel free to ask till then Peace, Blessings and Happy learning. nice design bro with lots of feature like input box, images for selective part etc. This is the great drop down menu.usefull for those who have lots of catogories..
XML error message: Element type "img" must be followed by either attribute specifications, ">" or "/>". Code 500"
Nice, I will try this out !! Thanks for posting this. Very helpful. Thank you so much. But i have a long doubt. How to post behalf of the menus like home etc,. You Have to create a Label For Every Category Like "Tutorials" "News" and Link them to your Menu. Now Whenever, you are publishing articles you can use that certain "Label" to show up the articles whenever user navigate your menu. We are currently working on a article that would help you understanding better that how Label Works!. But I have a confusion problem. I just resolved the problem, meanwhile, I discovered a bug. It's all the imagens on blog stay with the background from the Menu. Thanks! It worked well for my template. Hello, it's not working for me, I put the whole code in and it all looks like a normal menu, not drop down and it takes up half of the page. I mean everything, every word is printed on the screen. What can be wrong? At first it went to me like that. Check whether you pasted that style code above the ]]></b:skin. And this drop down menu works only in the simple templates of blogger. drop down menu went behind my post, was working fine till yesterday suddenly noticed this, Please help bro. There is a problem in your Template. The reason they are getting behind. Sorry i want to ask are the blue light the name of the page? And if yes. Must i replace the "#" with the label only or the web address Url? Please i need help. i use default blogger template and don't know what have to change. i already have drop down menu in my blogger template but i want to create the sub-child category. Will you tell me how can i do this...?